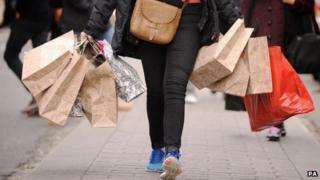 Economic growth in the UK was driven by consumer spending in the third quarter of the year, Office for National Statistics (ONS) figures show. The ONS kept its estimate for economic growth in the quarter at 0.8%, which is the fastest pace for three years. Consumer spending, which accounts for nearly two-thirds of the UK's economic activity, also rose by 0.8%, the most since the second quarter of 2010.
Business investment also grew, but exports fell in the quarter. Following the figures, the pound rose to an 11-month high against the dollar, of $1.6280, on hopes the UK's economic recovery is strengthening. "Market participants may have been waiting for confirmation of the UK's growth resiliency in the third quarter, as today's figures have spurred a significant leg higher in the British pound across the board," said Christopher Vecchio, currency analyst at DailyFX. The ONS figures showed that business investment grew by 1.4% in the July-to-September period, after dropping 2.7% in the previous quarter. But exports from the UK fell by 2.4% in the third quarter, while the net trade deficit widened to £8.9bn from £5.5bn. Jeremy Cook, chief economist at currency brokers World First, said the growth in private consumption, house building and investment had to "make up for a violent slip in exports". The headline growth figure may not have changed, but the detail in this second estimate of economic activity between July and September adds interesting new elements to the jigsaw. There was a bounce back in business investment, although not enough to reverse the sharp fall in the second quarter of the year. Household spending saw the fastest increase since the second quarter of 2010. The manufacturing, construction and services sectors all registered growth. But those hoping for a rebalancing of the economy away from consumption and imports will be disappointed. Exports in the third quarter experienced the biggest drop for more than two years. Net trade proved to be a major drag on overall economic growth. The UK is expanding more rapidly than other advanced economies. The debate will continue over whether that growth should ideally be more broadly based. He said the pound's increasing value made exports more expensive, while "economic and political matters had flared up in Europe, Britain's biggest customer base, once again". Mr Cook said: "The momentum in UK growth still sits with the UK consumer and I see this as a risk as we head into 2014, given the continual and persistent divergence between wages and prices." Howard Archer, chief European and UK economist at IHS Global Insight, welcomed the "marked pick-up in business investment, which had so far failed to come to the UK recovery party". However, he noted that business investment was still down by 6.3% compared with a year earlier. Lee Hopley, chief economist at manufacturers' organisation the EEF, said that although conditions were improving, the recovery still faced "challenges". She said: "Net trade is some way from supporting growth and there is a mountain to climb if business investment growth is to come close to the [Office for Budget Responsibility] forecast for this year and next." David Kern, chief economist at the British Chambers of Commerce said the weaker trade figures "highlighted the importance of supporting our exporters". He said: "While UK growth in Q3 was the strongest of the G7 economies, longer-term comparisons are less impressive. GDP is still 2.5% below its pre-recession level, while the US and Germany have made up their shortfalls." A survey by the CBI business lobby group suggested retail sales in November were little changed for the second month in a row. The CBI suggested the disappointing results were down to the milder autumn weather, which had put people off buying winter clothes. "This is the second month in a row that retailers' expectations for growth have been disappointed, perhaps due in part to the mild start to autumn," said Barry Williams, chair of the CBI distributive trades survey panel. "But despite challenging conditions on the High Street, retailers remain optimistic for the Christmas period and have taken on more employees in anticipation of a shopping rush that should add jingle to the tills."